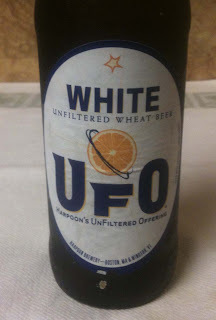 Today I will have a UFO (UnFiltered Offering) White, an Unfiltered Wheat Beer, from Harpoon Brewery. It is brewed with orange peel and spices. Twelve ounce bottle. The Harpoon web site shows 4.8% ABV and 10 IBUs. This beer's head was very thin and disappeared fast, but I think it was off white. Beer color is that of a somewhat cloudy lemonade. Fruity aroma, with wheat, citrus and a little spice. Mild to medium bodied. 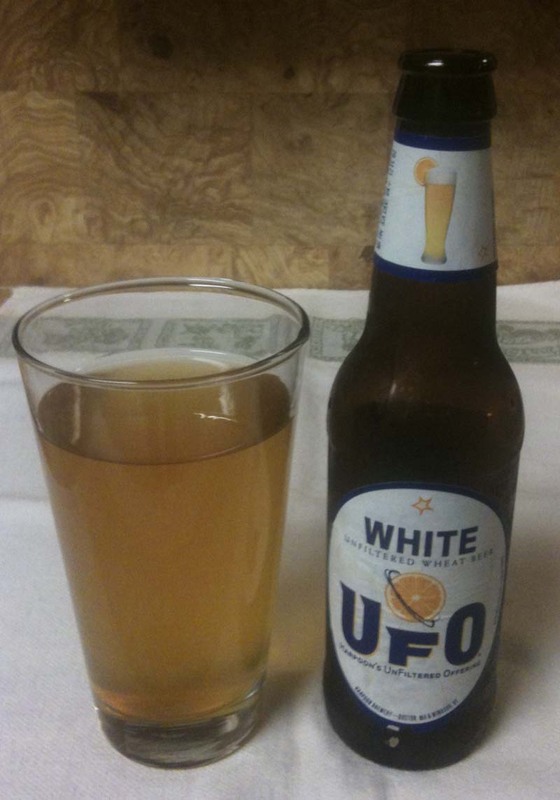 The taste is more of the same from the aroma, but more pronounced, particularly the wheat and citrus. There is a little bit of "bite" from the citrus, not quite a bitter; I assume it's the orange peel. Nice fizzy mouth feel/carbonation. Slight grassy/metallic and citrus aftertaste. Wasn't really sure about this one at first, but it grew on me and is one of those beers that makes a very refreshing summer beer.